Click Here to find out how to receive 2 for 1 on all qualified items purchased and for important information when using the online shopping cart to order Amazing C.
The Amazing C product provides a combination of Vitamin C, minerals and amino acids that provides a much more highly absorbable form of Ascorbic Acid. Also, this combination of nutrients in combination with Vitamin C will provide the body a surge of energy and increase the health of the small intestines. In fact, because of the ingredients in Amazing C there is a beneficial health effect on the villi such that there is an increase in nutrient absorption. Finally, Amazing C is pH balanced in order to balance the pH of the body as well as provides a high level of Calcium and Magnesium to build strong bones. Amazing C contains a unique combination of Vitamin C, amino acids and minerals that makes it a one of kind product and with all kinds of health benefits. 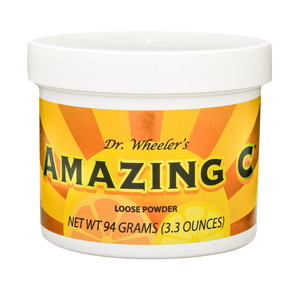 Amazing C is definitely the best Vitamin C product in the world. A half a scoop a day (one half a tsp) will provide over a thousand mg of Vitamin C along with calcium and amino acids. Simply measure a half a scoop and mix with water or juice for a tasty and refreshing beverage.